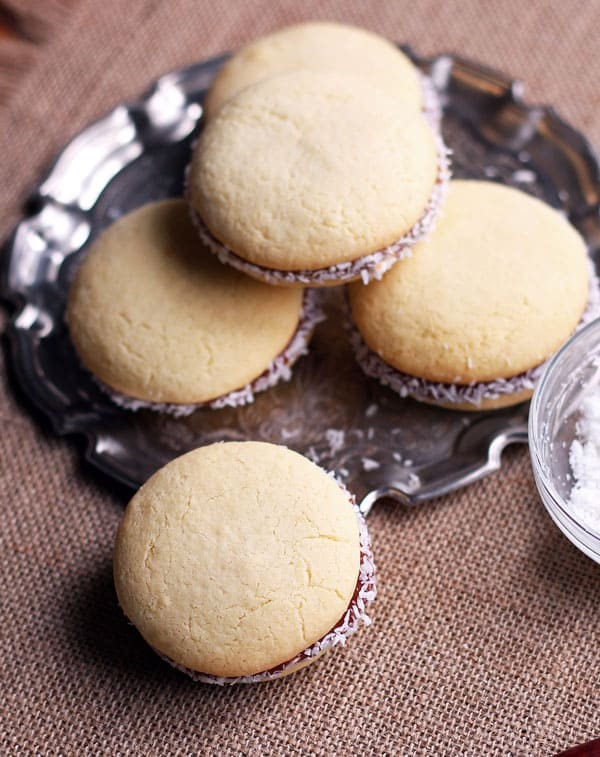 These delicate Alfajores Cookies are filled with Dulce de Leche and guava jam and rolled in desiccated coconut. The fine crumb texture of the cookies is achieved by a large proportion of cornstarch in the dough. Cinco de Mayo is one day behind us! What did you do yesterday? Any Latin-inspired cooking? A margarita at night? We had a few Latin-inspired culinary experiences yesterday. No actual margaritas for me right now, being pregnant and all, but I had a smoothie for lunch with Strawberry-Margarita-inspired flavors. While picking a rotisserie chicken at the supermarket, Konrad went for “Smokin’ Habanero” flavor (let me just sum it up as YUM!!) 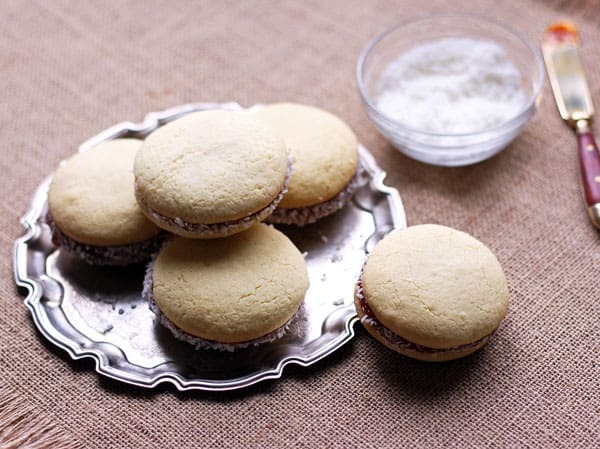 AND I made these Alfajores cookies. 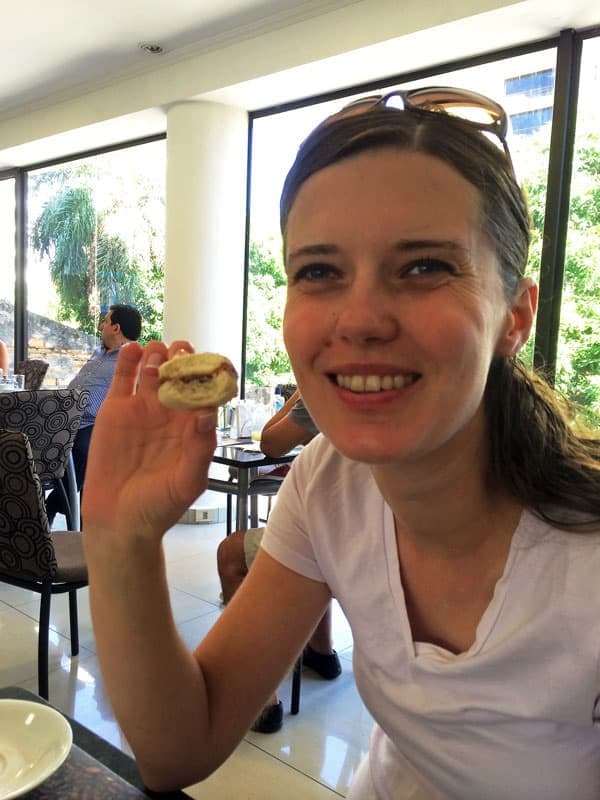 The sandwich cookies are only slightly sweet with a delicate texture, a filling of Dulce de Leche or Guava jam and edges rolled in desiccated coconut. Once I started looking up recipes I realized the secret for the light fine crumb of the cookies. A large proportion of cornstarch goes into the dough. Voila! Admittedly, the dough is not the easiest to work with. We live in a very dry prairie climate (unlike most Latin American countries), so I had to add an extra egg yolk to make the dough hold together. After chilling, the dough tends to break when being rolled out, but it can easily be pushed back together. See my notes in the recipe on thickening the filling if you want to use guava or any other jam as filling. 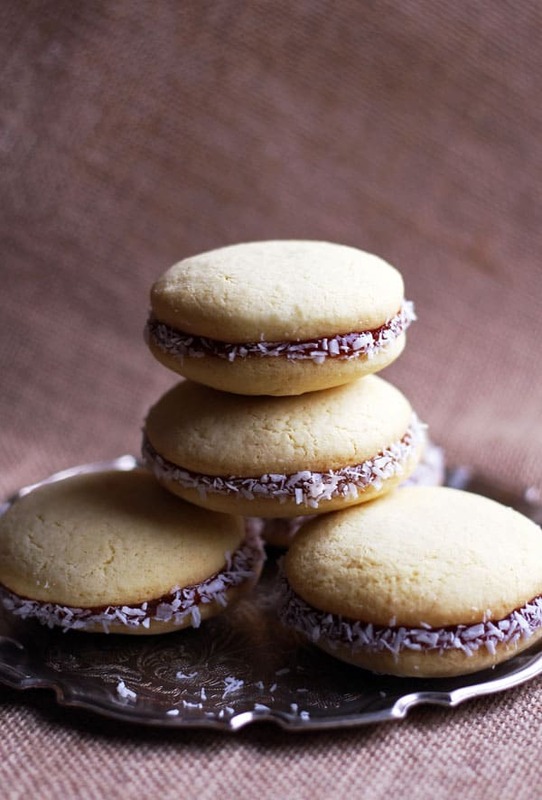 Alfajores will definitely have to make it into my Christmas cookie baking routine. But don’t let the weather hear me talk about winter already. Right now all I want is SUMMER!!! So, let’s get to the recipe! In a medium bowl whisk together cornstarch, flour, baking powder, baking soda and salt. With the paddle attachment of your stand mixer cream together butter and sugar until fluffy and light in colour. Add the egg yolks one at a time and continue beating. Add and mix in cream/liquor and extracts.On low speed gradually add the flour mixture and mix until just combined. (We live in a very dry prairie climate so I had to add an extra egg yolk to make the dough hold together). Turn the dough out onto a piece of plastic wrap and shape into a flat disk. Wrap and chill in the fridge for at least one hour. Preheat the oven to 350 degrees F and line 2 baking sheets. Sprinkle flour on a piece of parchment paper and on top of the dough disk. Roll out the dough to about 1/4 inch thickness. The dough might break but you can easily push it back together. Cut out circles (about 2 inches) and place 1/2 inch apart on prepared baking sheets. Reroll the dough as needed. Bake one baking sheet at a time for about 10-13 minutes until cookies are set but still light. Immediately transfer to a wire rack to cool. If using jam for filling thicken it by heating it either in the microwave for about 2 minutes (it should come out bubbly) or in a small saucepan on the stove top while stirring often. Let cool completely. 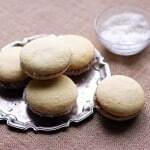 Spread a little jam or Dulce de Leche on a cookie and top with another one. Press together lightly until the filling shows and roll the edges in desiccated coconut. I Iike these. they look great! Girl, you have been on a blogging blitz! I can’t seem to find the time to sit long enough to complete a post. I have about ten drafts just patiently waiting for my attention. Cookies for breakfast is also my thang! 😉 Loving the flavour combos and the texture of these cookies. I will most certainly give them a try!